Who has seen Yo Gabba Gabba? Nick Jr’s popular television program Yo Gabba Gabba has become a cult hit among the college set. In addition to popular characters such as Muno, Foofa, and DJ Lance Rock, the show has featured a variety of musical guests including Weezer, The Killers, Devo, The Roots and Jimmy Eat World. I’ve watched the Weezer music video and it is insane. Presumably the musicians wanted their offspring to hone their music chops at an early age. At any rate this bunch of crazy characters is coming to Fort Lauderdale on March 23 and 24 for two shows daily at the Broward Center for the Performing Arts. Tickets are available here. 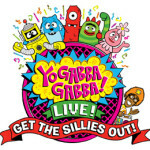 We have a great upcoming interview with one of the creators of Yo Gabba Gabba so stay tuned for more fun.